I borrowed this little, yellow fishing lure from my buddy Todd. Todd had inherited a lot of his grandfather’s fishing equipment when he and his wife moved into their fabulous lake house on Bolton Lake in Connecticut. This lure is of the popping plug variety but has some unique features starting with its color. Up until now most of the plug-style fishing lures I had been painting have been blue or green in color, occasionally with a quick splash of red here and there to add an accent. This lure, on the other hand, is a vibrant yellow. 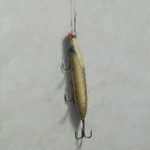 What also distinguishes this lure from the other lures is the way the treble hooks are attached. Each and every one of the other lures had their treble hooks attached to an eyelet that screwed directly into the body of the plug. That body is typically made of wood and is painted and decorated. 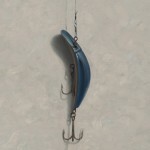 This lure doesn’t have those eyelets but another attachment system, one I’ve never seen before. To attach the treble hooks it’s got this strange plate that is attached to the lure’s body with two simple screws. It almost has a “DIY” quality to it which makes me wonder whether or not this lure was part of some kind of novelty build-it-yourself kit or even made to have interchangeable hooks. 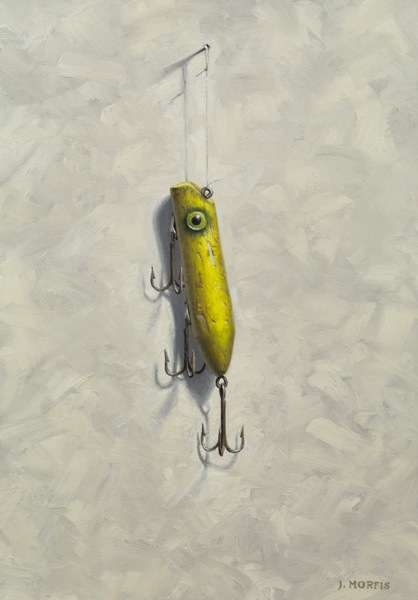 Besides the color, I was also drawn to this lure by its huge eye. Most of the other lures have plastic googly eyes fused to the head, but this eye is constructed from a large circular depression in the wood that is then painted. 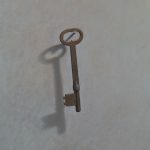 I thought that was pretty neat looking and definitely made for a nice focal point within the painting. 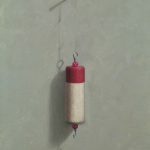 To harmonize my oil painting of the lure, I found myself warming up the background hues a bit. I definitely enjoy working from a relatively neutral palette when painting most of my backgrounds, but that doesn’t mean I stick to pure neutrals. I ended up using a little more raw umber and even burnt sienna in the background to alter the neutral colors slightly towards the yellow and orange spectrum of hues. It’s these little effects that are hardest to explain but do the most when trying to make artwork have that everlasting quality of beauty!